Chris Rock hosted the ceremony and all eyes (and ears) were on him as he gave his anticipated monologue and called out Hollywood on its racism. 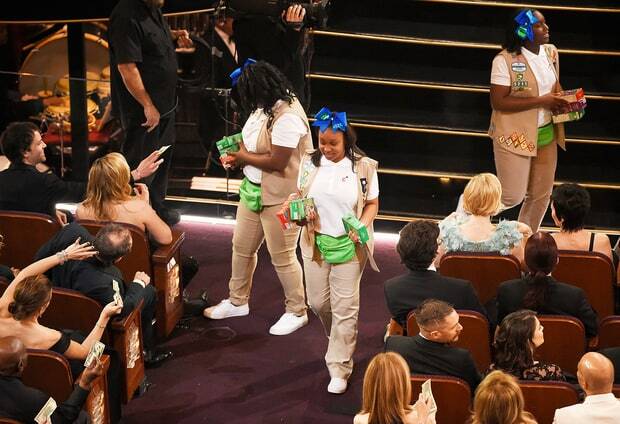 Girl Scout cookies were present and accounted for, and I can't be the only one who was jealous of the celebs with their boxes of Samoas, taunting me from the TV screen. Lady Gaga’s chilling, but powerful, performance of Til it Happens to You and the sexual abuse survivors who joined her, united on stage. C3PO, R2D2, and of course BB-8's fangirl moment . And the biggest event that had everyone jumping and screaming and crying for joy...Leo finally won an Oscar for best actor!!!! Ladies and gentlemen, Kate Winslet was all of us.